Designing a monument, choosing a project between many, building a place for remembering this piece of history and giving it a proper use and legitimacy, seems to be a very hard task. The winner of the contest was the project of Ursula Wilms, who also designed Topographie des Terrors… It consists on a semitransparent glass wall over a black granite surface. It will presumably be nicer in a sunny winter day that under the sun of summer. But that would be, in fact, an interesting idea: to make you feel you just can´t stand there, that you are not in a safe and comfortable place devoid of conflict. Some instructions may be installed so people do not touch the glass or play volleyball. 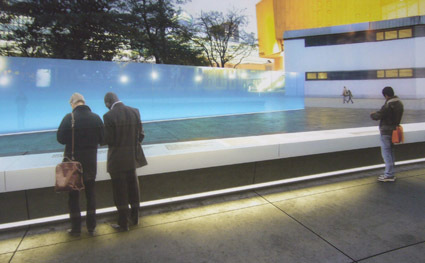 Just like in the Memorial to the Murdered Jews of Europe in Berlin (that other monument to abstract art with rect angles) where people can not sit nor jump or play, as the architecture of the place invite them to do, but obbey guards´admonitions and instructions that are written on the floor. 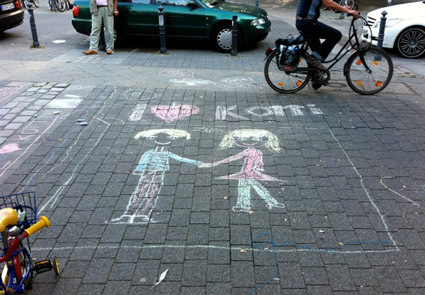 The 2nd prize of the T4 contest was for Yves Dreier, who brought the project for building a robot, a quite close estethic relative of Star Wars’ R2d2, which is able to write “I love you” on the floor once and once again. It may work as a testimony of human failure to face History, in contrast to the digital storage of memory. 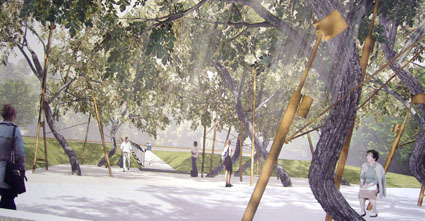 The team of Kapok proposed to use a variegated group of twisted trees as main element, in contrast to a platton of straight trees. The metallic structures that support the trees trigger voices with testimonies. It seems that the comparison of trees and humans was more resisted in the jury than a writing robot or a big glass screen. Elias Canetti thought that forests were the main symbol of mass for the germans, but that was before every natural wood of Germany disappear for making cars. The common experience for most of us is that monuments are boring and devoid of any significance, just like almost every art exhibition. 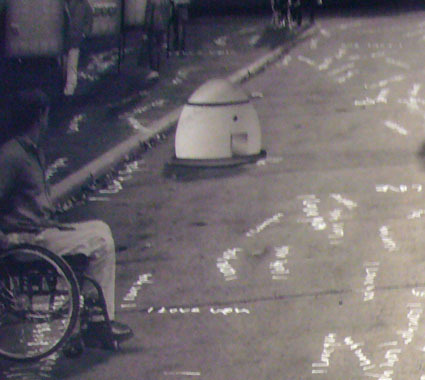 The social forces tend to make them: 1. part of the machine of reproducing normality and boredom in the surplus cities, 2. a testimony of traffic of influences in public institutions, 3. an exhibition of technoarchitectural power and 4. a double attempt of perennial administrations on forging History and being remembered. But it’s not always like that or just like that: the Gleis 17 monument in the train station of Grunewald, Berlin, is a meaningful place. The platform 17 was one of the main points of deportation of Berlin jews to the concentration and extermination camps. 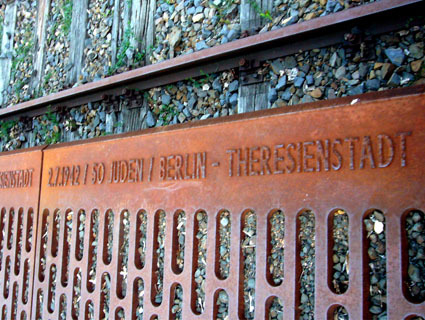 The decision was to install all along the railways metallic plates with the dates of deportation, number of deported jews and the place of destination. They are in chronological order, so you can follow the regularity and the rythm of the deportation as a bureaucratic and normalised process, that ended just some weeks before german capitulation. There is no representational nor symbolical expression of the architect ego. Some trees are growing in the railways, serving as a symbolical obstacle for future functional use. The monument was an initiative of the Deutsche Bahn and the project was designed by the team of Hirsch, Lorch & Wandel. The German train, by the way, has been recently sued in US courts, as the french SCNF also, for the key role of its antecessor DRB (Deutsche Reich Bahn) in the holocaust. Jews were forced to pay the tickets to their death to the SS. The SS then paid the DRB, or the SNCF in France, a third class ticket for every passenger. Children paid half price. Now thousands of survivors want the modern and expensive european trains to help them pay their medical bills. I hope they do. Effective monuments are not enough. The possibilities of monuments are not restrained to designing and visiting them, but also give a chance to more original interactions. This is the monument in the Berlin Hasenheide Park to the memory of Friedrich Ludwig Jahn, the founder of german gymnastics and enemy of the aristocracy, priests, Frenchs, Poles, Napoleon and Jews, between other non really germans. 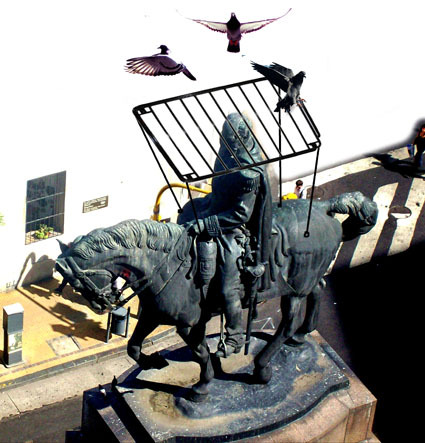 The degradation of the Buenos Aires Monument to Julio Argentino Roca was initiated in 2004 by the Comision Anti Monumento Roca, via graffities and different interventions. 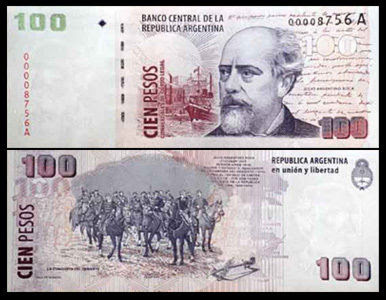 Roca was a general that became president of Argentina (1880-1886 and 1898-1904) after leading the killings of thousands of mapuche in the south of the country for the expansion of Argentinian borders. His statue is one of the biggest in Buenos Aires and was erected in 1941. Since the interventions began the monument lost its powerful aura. Its walls are being used since then for gluing posters of every kind. The discussions about this killer of indians and his representation in schoolbooks, monuments and in the 100 pesos banknotes multiplied. 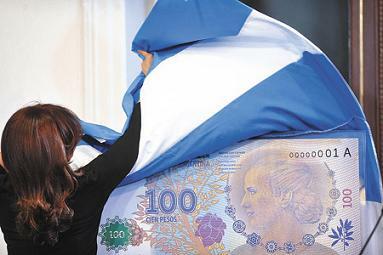 This year Cristina Kirchner announced that his face in the highest argentinian bill will be removed and give place to Evita. 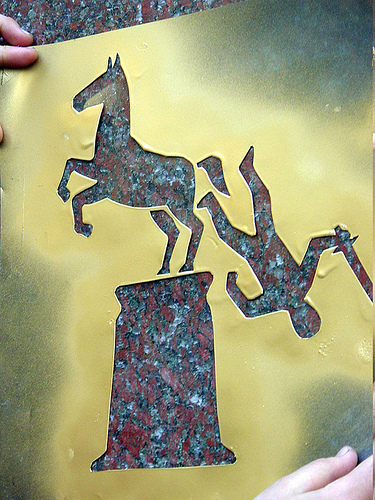 In the last couple of years a group of artists and activists are collecting keys for making an alternative bronze statue and remove the equestrian image of Roca. Their idea is quite platonic: to make a monument to the aboriginal woman. This female figure would represent all the women from mapuche, tehuelche, toba, wichi, guaraní, ranculche, pilagás and other cultures. 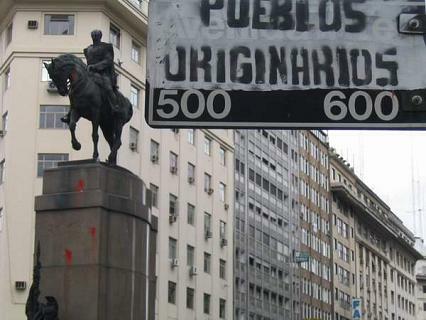 The esculptor on charge is Andrés Zerneri who already made super Che Guevara´s statue in Rosario. The rejection of classical repressive characters is a positive step in our historical conciousness growth, but we are still lacking a stronger rejection of the formats and the relationships of obedience that make them possible. 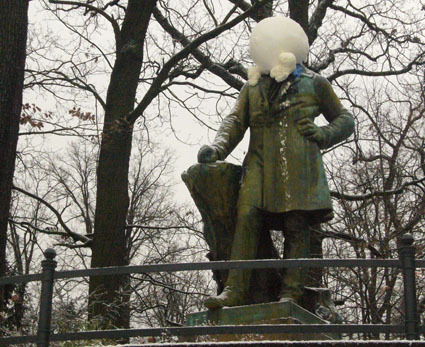 Some people have proposed to go on with the degradation of the monument, but reloaded. They remind us that Roca was part of History and believe that is good to remember him as well as the social class that made the monument and still salute him. But they propose to do it in a more proper and sensitive way. Strategy and tactics are key related concepts that recognise the existence of conflict and the necessity of anticipation for those who take part. Coming from the knowledge of war, they have pervaded all kind of institutional discourses, including those of marketing, art and science, where social confrontations usually remain obscured. Sharing a definition of these concepts and a common understanding of their relationship can be useful to orientate our participation in communication activities that seek for social change. The concept of ‘strategy’ refers to the development of all the combats all along time and space in a war. For establishing a strategy it must be considered the total force which will be involved in all the confrontations. Each of these it’s a particular composition of forces that enter into a direct exchange. The term ‘tactics’ refers to each singular and direct encounter. The real development of a war and its combats is not a linear result of the confrontation between two fighting logics, of the strategic lines and the toolbox of tactics defined by those who take decisions in the bands in conflict. To believe so we should dismiss many facts that escape to the plans and hold a teleologic conception of the belic, the political and economic dimensions of reality, where everything would result of the strongest will and the best plan. But in reality, in our most intimate or public struggles, we must deal with both chance and necessity, as well with processes that remain out of reach of our conceptual frames. If we want to find consistent antihegemonic strategies from the political to the artistic, and viceversa, we can’t wait that these will emerge from the tactics themselves. We can learn many things from collecting and comparing tactics, in order to increase our potential toolbox when new tactics are needed, but we will have to jump to a wider dimension where those tools are also included. Tactics will be there but in relationship to other elements, other social identities and in another scale of time and space. Every tactical action belongs already to a strategy: to a scheme of action that has set his strategic goals. Of course, it may be not your own but other people’s strategy. When we don’t think for ourselves other brains are thinking for us. The weak playing tactic games that can offer a transient resistance or a moment of surprise to the strong, but are devoid of any strategic accumulation, on the long term help the latest to increase their financial, cultural and belic power. When a bunch of people, weaker or stronger, decide together a specific tactic, they share already a conceptual frame of conflicts and desires that belong to the strategic dimension. We can then see strategy and tactics as two different scales of decision in a struggle, which relationship will have some conceptual challenges similar as those present in the problematics between local and global, abstract and concrete or acting and thinking. In our development as individuals, which biologists call ontogeny, action is previous to thought. Babies start to explore the world before thinking about the world. The same discovery of having hands need the hands to move previously. The same happens in the microscopic level: hazardous movement of cell structures are a precondition for the occurrence of functional connections. Neurons are active in early stages of brain development before specific synapsis are wired. Though the ontogenic origin of learning through action is an universal experience, once we understand that our actions may have some consequences, thinking becomes an increasingly important action. 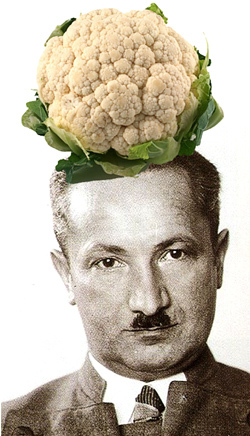 Thinking is an action too, but it requires other kind of actions to avoid circular compulsions to repetition or the danger of loosing ourselves in the rethorical cauliflowers that Max Ernst so much abhorred. On the other hand, the experiences and lessons we “collect” as knowledge of more complex processes are not just an original product of our own personal actions and reflexions but mainly from others. Our strategic and ideological constructs, then, are not an emergent construction of our tactical experiences and the reflexion and generalisation on them, even when they have the chance of enjoying a consistent totality. They are also the result of confrontations in the theoretical field. The question for being concrete is not to keep just in the tactical dimension, but making a stronger attempt to discuss strategies both for the “inside” of the cultural-artistic field itself and its “outside”, its connections with human and nature exploitation, which means with war. As a reaction to misinformation in the press today, the Action is Concrete group wrote the following clarification for the public knowledge and with the desire of sharing the discussion with all participants of the Truth is Concrete Camp. 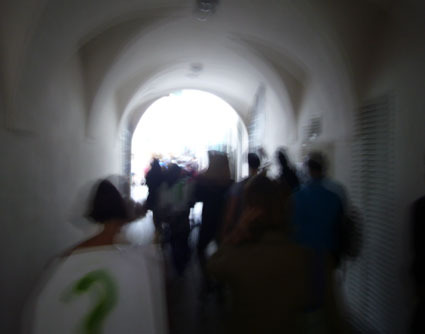 Yesterday our group “Action is Concrete” realized a series of political and artistic interventions in the city of Graz. We are a collective made up of international and local cultural workers who met in the context of Truth is Concrete, which is a curated program of the steirischer herbst. 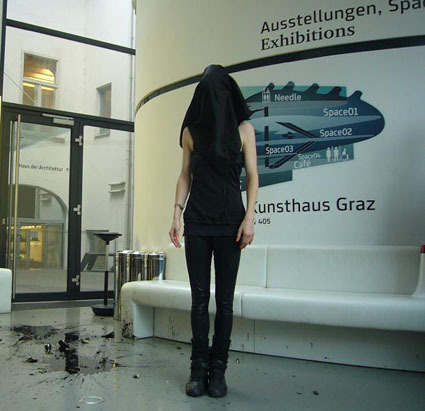 At 4:00 PM we invited the general public to participate in a creative protest tour through Graz. A group of more than a hundred people convened on the terrace of the Thalia building which is the physical platform of “Truth is Concrete”. The first action was “Smashtown, a Patriachal Die-In” in which both men and women performed symbolic suicide and took a performative oath renouncing oppression, especially in the gender context. 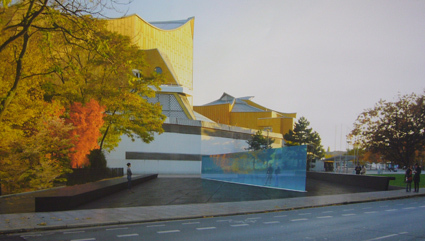 After being “reborn”, the congregation marched through the city of Graz toward the next location, the Kunsthaus. Here, an oil spill and exorcism were performed. Raiffeisenbank, the main sponsor of the museum invests in the oil industry and its exploitation of people and the planet. With this action we wanted to highlight the complicity between corporations and public cultural institutions. 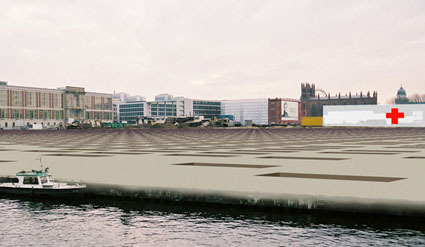 The group then moved to Hauptbruecke where a black cloth was hung into the river to protest against the plans for a new power plant on the river. The group then moved to the Hauptplatz where a collective begging action took place addressing the new discriminative laws prohibiting begging in Styria. 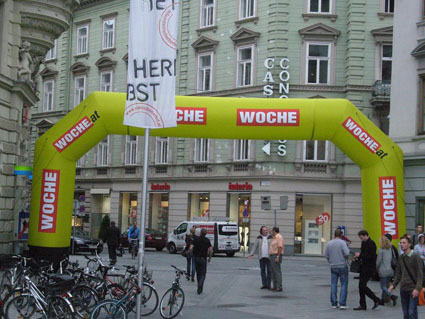 “Tomorrow 26 September 2012, a jolly group of local and international artists and cultural workers will take to the streets of the capital of the Styria, Graz! They will visit local points of interest where global and local conflicts merge into one. 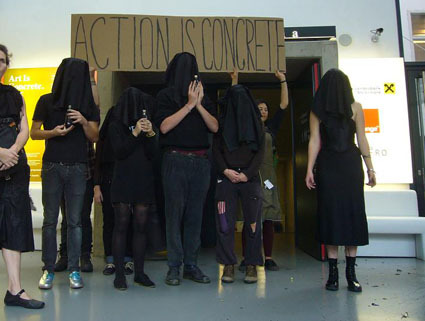 Die Gruppe „Action is concrete“ (Aktion ist konkret) realisierte gestern eine Reihe von politischen und künstlerischen Interventionen in Graz. Wir sind ein Kollektiv von internationalen und lokalen KulturarbeiterInnen, die sich im Kontext von Truth is concrete, einem vom steirischen herbst kuratierten Programm, getroffen haben. Um 16 Uhr luden wir die Öffentlichkeit zu einer kreativen Protesttour durch Graz ein. Mehr als 100 Menschen trafen sich auf der Terrasse der Thalia. Die erste Aktion hieß “Smash-Town, ein patriarchales Die-In” in dem Frauen und Männer einen kollektiven Suizid performten, um danach als “wiedergeborene”, nicht mehr unterdrückte Wesen den Demonstrationszug zu eröffnen. Dieser führte durch die Herrengasse zum Kunsthaus. Hier wurde gesungen und “Öl” verschüttet, um die bösen Geister des Kunsthauses zu vertreiben: Die Raiffeisenbank ist der größte Sponsor des Museums. Sie investiert in die Ölindustrie und trägt somit zur Ausbeutung von Mensch und Natur bei. Mit dieser Aktion soll auf die Komplizenschaft zwischen Wirtschaftsunternehmen und öffentlichen Kulturinstitutionen hingewiesen werden. Die Gruppe bewegte sich dann zur Hauptbrücke, wo ein schwarzer Stoffstreifen in die Mur gehängt wurde, um gegen die Pläne für ein neues Murkraftwerk zu protestieren. Schließlich gab es auf dem Hauptplatz eine kollektive Bettelaktion gegen das diskriminierende Bettelverbot in der Steiermark. “Am 26. 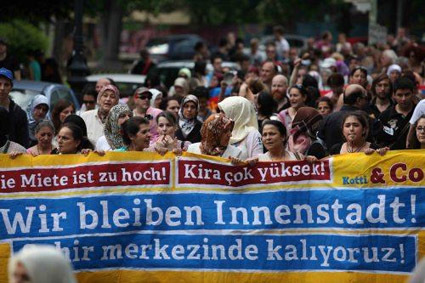 September 2012 trifft sich eine bunte Menge von KünstlerInnen und KulturarbeiterInnen aus Graz und aller Welt um gemeinsam in der steirischen Landeshauptstadt auf die Straße zu gehen. Sie werden verschiedene Orte besuchen an denen lokale und globale Konflikte aufeinander treffen. 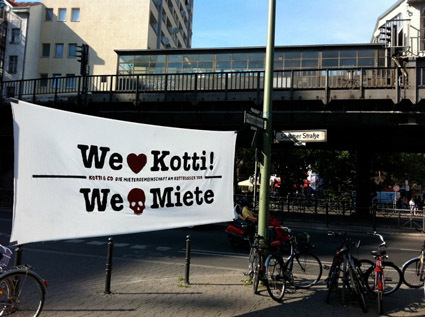 The neighbours of Kottbusser Tor South, also known as Kotti, in the heart of Berlin-Kreuzberg, are preparing their 1O th noise demonstration. What do they want? something that sounds quite simple: to put a limit to the rents of their flats. Their prices are going up to the sky, as Berlin becomes so trendy. Kreuzberg used to be the less touristic place of West Berlin during the Cold War, a marginal place besides the wall were just the turkish immigrants and young germans escaping from the military service could feel at home. Its punk, antifascist and multicultural resonances can still be found, between the no soul of the expanding plastic shops and their cyborg costumers. They still make the place more attractive than most of the city in the eyes of artists, tourists and… investors. Artists are an important part of the process. Even if most of them do not sell their work and are quite poor, they recognise the special charme of the place and then make it more charming in a more digestive way. Something similar happens with the pseudohippies that suddenly discover distant fishermen villages in the coast of Brasil or wherever: they prepare the terrain for five stars hotels. So there is no real paradox that the Kiez becomes more and more expensive: what there is, and certainly a lot, is ambivalence. And reaching this point is good to hear Automatic City by Leise&Lento and to sing it as well! The gentrification of Berlin, at least in the brains of speculators, seems to have no limit. For every neoliberal-guided process during its ascendent curve, physics limitations don´t exist, people and materials don´t resist, spaces can be valorated, in capitalistic terms, ad infinitum and social value it´s reduced to the values of a limitated social class: the gentry. But it happens that suddenly some people do resist and decide to stay in the place where they have made their lives and weaved the social, affective and economical relationships that constitute the fabric of their identities. And some artists decide that instead of selling their works about gentrification in art galleries and glossy paper catalogs, can provide tools of resistance and share their time with their neighbours. And some “representatives” remember that the State can play a role that is not precisely to help the rich to be richer and the poor to be poorer! 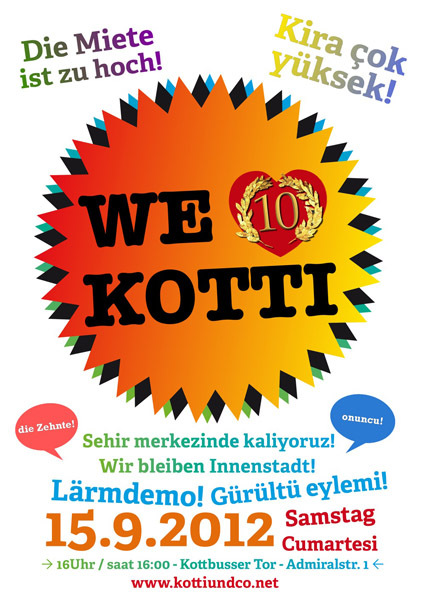 The neighbours of Kotti are giving every citizen and passer-by a political lesson that combines the moral strenght of a just demand, with the creativity that can make that demand to be heard, the persistence to avoid its social dilution and mediatic neutralisation and, last but not least, the openness to invite ALL the social actors around to support it, even at the risk of having an identity crisis and acting against their own interest. Dear tourists and english speaking friends! this is a protest camp of a tenant group located at kottbusser tor / south. 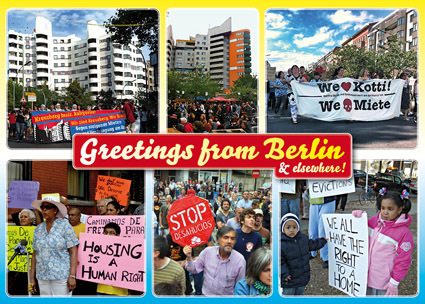 as you might haved heard – rising rent and gentrification is a big problem for us living in berlin. here you can read our demands. 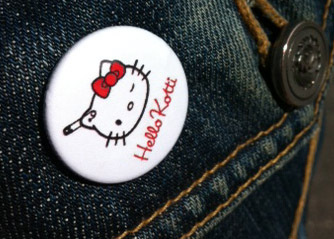 if you are curious – just stop by – have a tee and chat with us.